No one can know the future. We can’t predict with 100% accuracy what’s going to happen. How many times have you watched a sporting event and said, “This games over” only to have the outcome be not what you were expecting? It happens all the time. We don’t know what will happen with our life, our relationships, our financial fortunes, or our health. We can’t predict any aspect of what will happen in the future other than the fact that we all will die. And there is still uncertainty surrounding that event in that we don’t know when it will happen. Even though we can’t know the future it doesn’t stop us from thinking about it. It doesn’t stop us from wondering how things are going to unfold. And it doesn’t stop us from thinking about these things a lot. In fact, we can get so swept up in thinking about the future that it negatively impacts us in the present. Have you ever thought about something for so long and so hard it started to bother you? Bothered you to the point where you couldn’t sleep? Or maybe you started getting nervous or even scared? Have you worried about something to the point where you almost became obsessed with it? Where you couldn’t think about anything else? Maybe you started to panic, get sick, or lose your appetite. Maybe your performance suffered in school or at work. If these things are happening, then you’ve crossed a line from merely thinking about the future to full-fledged worrying about it. And that’s dangerous because too much worry can keep you from moving forward with your life in the present. It can lead to bad decisions being made or to making no decisions at all because you are so fearful or uncertain of the outcome. It may have become apparent that there is a delicate balance between thinking about the future and worrying over it. It’s impossible to not think about the future. In fact, I’d say it’s unwise not to. We have to be aware of what might come down the road so we can plan for it. Planning for the future and worrying about the future are two separate things. Planning is very strategic. Worry can accompany it but it doesn’t have to. Planning is rooted in actions and seeks to produce results that are thought out and calculated ahead of time. Because of that, there is less emotion involved. Worrying about the future is all about emotion. It’s fueled by the unknown…by uncertainty. There is no strategic planning when we worry – only speculation that leads to confusion and fear. Neither of those emotions help us be productive in the here and now. The bottom line is this – when we worry about the future we become unfruitful in the present. That’s not a present life that I’m going to enjoy. I approach solutions to problems from within the confines of my faith in God. You may have another belief structure to help you deal with worry and that’s fine. I’m just telling you what works for me. When I choose to worry, what I’m really doing is removing God from the equation of my life. I’m placing my trust in myself to deal with my future the way I want. In essence, I’m saying my way of solving things is better than God’s. I like the imagery of the second plant much better. Notice how the tree isn’t worried about future events. It doesn’t fear the heat. It isn’t anxious when there is a drought. It’s growing and always bearing fruit. In other words, this tree doesn’t let the cares of the future impact it’s ability to produce in the present. It has placed its trust in a source that can sustain it and help it focus on the things of the present that really matter. I don’t want worrying about the future to make me become that unproductive shrub living in a parched, barren land. So my remedy is to leave tomorrow up to God and put my trust in Him to handle it. After all, He’s the only one who really knows what’s going to happen. Questions for Discussion: Do you catch yourself worrying too much about the future? How do you handle it? 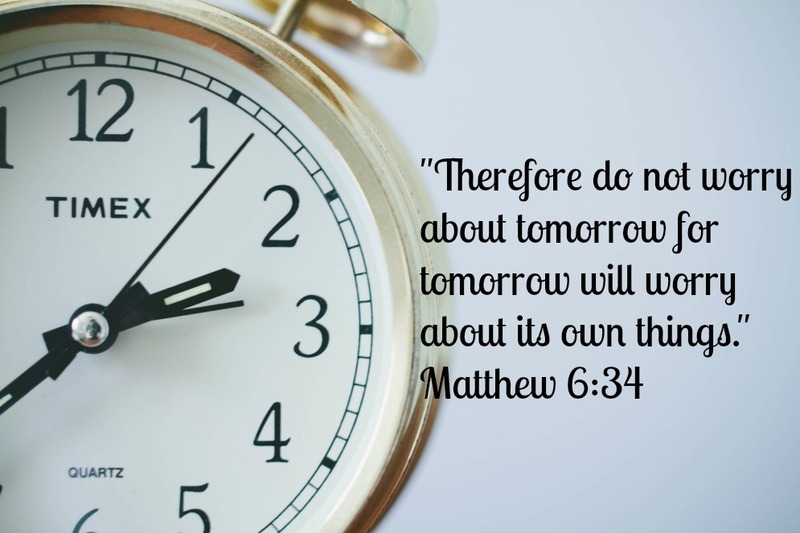 How do you keep worry over future events from impacting you in the present? Do you think it’s unrealistic to say do not worry about tomorrow – because we invariable will? It has taken me a while to get there, but I have learned to deal with worrying about the future with a very simple approach. I realized that worryng about something has no bearing on the outcome. The outcome will be what it is. I can plan and I can strategize and I can do everything possible to influence the future. Those are all positives actions and can have a bearing on the future. But worrying about the future, there’s just no point. I have faith that no matter what happens in the future, I will be able to deal with it. “…worryng about something has no bearing on the outcome…” That’s a great point and really crucial to dealing with worry. There is no point getting all worked up over things that you cannot control. I worry no more for tomorrow has its own time for me to worry about. But, what I do now is really important as it affects what may come tomorrow. I add my thanks to those of Clarisse and Tanya. Your article is well thought out and gets to the point of our pain: trusting the Lord to do all He has promised He will do for His children. Thanks again Brian! I am a new christian and have a slight problem with this. Yesterday I was constantly worried about tomorrow, would I have enough to pay my bills? Then I joined a church for the first time and started budgeting, and putting something aside for tomorrow. Now I mostly worry about what those dollars are doing. While I wasn’t looking, my bank balances have climbed beyond my imagination. Is that leaving out God or not “trusting in God?” I am very grateful that God and Jesus are in my world. I credit them with the changes that have happened, financial security among the many blessing I have experienced lately. You are experiencing something economically called “compounded interest.” 🙂 That is not leaving out God, that is letting all those little dollars do their job and multiply. You sound as if you are going through something similar to what I have been going through — Am I placing my trust in riches or in God? At the end of the day, were you to lose your home, your belongings and everything in the bank, could you still praise God for His grace and mercy to you? If you are confident that you can do that? You rule money, it doesn’t rule you. Our Lord bless you Tanya. May you continue to grow strong by the living waters that are our Christ Jesus. Thanks a lot for this great post! I can’t help, but to worry what will be my future. I should always put in my mind that God is always here. You’re welcome Clarisse. Thinking and worrying about the future are two separate things. I think about it all the time…I just try to not let it get me all worked up. It’s a fine line between the two things I know.